The 2015 Los Angeles Final Leg has begun in California! 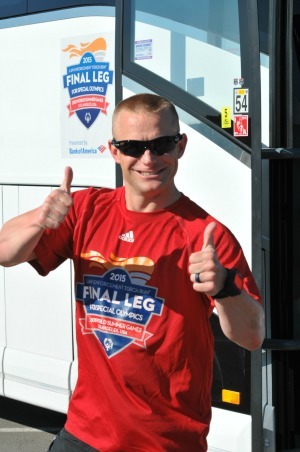 Nebraska is proud to be represented on this Final Leg by Sgt. Tony Kavan of the Nebraska State Patrol Academy. Today is the first full day of running for the Final Leg team, which is carrying the World Games Flame of Hope throughout all of California to raise awareness for the Special Olympics World Games Los Angeles 2015. The Flame of Hope will be delivered by the 126 member Final Leg team to the Opening Ceremonies of the World Games in Los Angeles on Saturday, July 25th. Sgt. Kavan’s Final Leg team consists of law enforcement and one Special Olympics athlete from all over the world, including: Republic of Ireland, Pennsylvania, Connecticut, Bahamas, Colorado, Korea, North Dakota, Austria, and Iceland. His team is part of route 3 and will run through areas of California including: Sacramento, Sonoma, Oakland, Berkeley, San Francisco, San Jose, Santa Barbara, Palm Springs, Beverly Hills and Los Angeles.